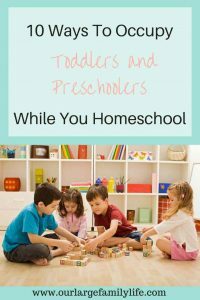 Homeschooling when you have toddlers and preschoolers in the house is possible. It may seem like a circus most days since it can be quite the juggling act. Sometimes this is true. Toddlers and preschoolers can go through spurts when they are quite contented to play by themselves or with each other. …it usually doesn’t stay that way. Life happens in seasons. You may have a new baby that gets thrown into the mix. Maybe your toddlers’ previous playmate is doing school now, and they find themselves with no one to play with. It’s a whole lot easier to homeschool when you have little children around if you are prepared. Right now while I am homeschooling 4 kids, I have three kids, 5,3, & 2 that are also running around while school is going on. Homeschooling with toddlers and preschoolers running underfoot can feel like an unbeatable challenge, but with a few creative ideas and a plan, you can succeed. Keep your little ones occupied so you can get school done. While it might seem like kind of a pain to have to keep track of the littles and have them on a schedule, it will actually help you out. It will also keep things fresh so they don’t get bored and come running in the middle of a lesson. Having a schedule lets them also be aware of what is going on. It allows them to be excited for what comes next. It will allow them to concentrate on what they are doing and look forward to the next thing. Start off your school morning by giving your little ones some one on one attention. This will allow them to be ready to play independently while you work with your older kids. Read some books, play a game or just holding them will fill up their love tank so they are ready to do their own thing. Keep kids moving to new locations throughout your house will help them from getting bored and give them a new place to be. This may be harder depending on the size of your house, but they could start out playing in a bedroom, move to do an activity at the kitchen table, then the living room and afterword outside (depending on the weather). I don’t know who invented the toy box, but they clearly hated parents and wanted to see them cry. Everyone knows that all the toy box does is provide an easy way for kids to dump all their toys on the floor and not find what they are looking for. Having toys in separate containers is a lifesaver not only for keeping the house tidy but also for bringing old toys to life. If you don’t give your kids access to all toys all the time, they will be more interested in them when they have the chance to use them. Switch up what toys the can have after so long and they will be more inclined to play knowing they don’t get unlimited time. It will also allow you to have them clean up what they are doing before they get something new. As my kids get closer to school age they start wanting to do school too. As I don’t plan to do any formal work with them until they reach the 5-6 age, activity books are a great way for them to get “school” time at the table. Coloring books, connect the dots, and wipeable books are a great way to keep kids occupied at the table while you work with the rest of your kids. We were gifted these reusable sticker books last Christmas that my kid’s love, so I picked some more up at a homeschool conference this year. It’s no secret that little kids love messes. If you aren’t concerned too much about such things you can get out playdough, paints, or moon sand that will keep them occupied. I’ll be honest, I’m not always in the mood to do things like this, but they are always a hit. I can always get a lot done. Schooling during naptime has always been one of my favorite times to homeschool. Naptime is a great way to get one on one work done or things that need more concentration. I know naptime is typically the time moms look forward to resting or catching up on housework, it can be a great time to get uninterrupted time for school. Everyone may need a change of scenery and you can mix up your lesson by going outside. Read aloud, nature study, drawing, and science experiments are all things that can be done easily if not better outside. This will give your little ones a chance to run and use some of their energy and you can be out there to watch them at the same time. Older children teaching the younger children is a great way for older children to reinforce the concepts they have already learned. At the same time, younger children get the help they need on their assignments. This gives mom a break to help little ones that may need changing or help to eat. My only caution would be to make sure this doesn’t become too much of a habit that hinders the older children from being able to complete their own work. To be honest, I haven’t used audiobooks a whole lot with our homeschool yet. I would like to explore it more for something the kids can listen to in the afternoon or riding in the car. It could also be helpful for children who are learning to read to follow along with a book. Little ones could also sit and listen to shorter stories while they are doing an activity that keeps their hands busy. Homeschooling with toddlers and preschoolers running around can be difficult. Having a plan for them while you do school will help everyone to have a good school day. Sometimes having them along with you can work out well especially if they are at an age when activity books and “doing school” is fun. Other times they need other activities to engage their mind so you can help your older kids with school. Finding different activities and being prepared with everything you need will help you to have a less stressful school day. What activities do your little ones like to do during school?